Just as honey bees are found all over the world so are recipes that use their honey. Caribbean jerk, Spanish chicken, French sauces, British biscuits and Turkish cakes all gleam with the sweet stuff. It can take just a spoonful or two of honey to bring its deep flavour to a dish. As a marinade it can enhance meat and poultry, and it works particularly well with nuts and fruits, cream and cheese, and herbs and spices. 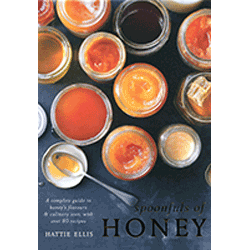 Along with recipes for delicious honey dishes, Spoonfuls of Honey describes different varieties of honey, explains what to consider when buying and storing, gives tips on its use in your cooking, explores the benefits to your health and the role bees and honey play in nature.